In RawTherapee, we call the sidecar files 'processing profiles'. We supply a bunch of processing profiles with RT, so that you can start off with an existing look and modify it to your liking, saving you some time. One example of such a profile is "Pop 1" - it will make your photo vibrant and lively, lifting the shadows and bringing out detail. You can see the whole list of processing profiles in the Image Editor tab, if you expand the Processing Profiles list. You can also see them if you right-click on a thumbnail in the File Browser tab and move your mouse over to "Processing Profile Operations > Apply Profile". Read the short " Processing Profile Selector" article to make sure you understand how to make full use of the selector, partial profiles and the fill mode toggle button. Apply a custom-made processing profile using the context menu in the File Browser (or Filmstrip). 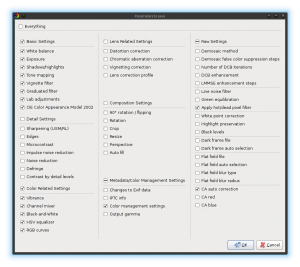 Apply a custom-made processing profile using the drop-down menu in the Processing Profile Selector in the Image Editor. You can create your own processing profiles and have them shown in the Processing Profile Selector drop-down list. Open a photo you want to create a good starting point profile for. You could start off with the 'Neutral' profile, or make changes to any of the other profiles that come bundled with RawTherapee. Just apply the desired profile to your photo. Make the changes you like, remembering that the more specific your tweaks, the fewer photos they will work well with because every photo is different so what works well for one may not work well for another if they differ significantly. For example if your camera has a very low-noise sensor and your lens is not very sharp you could probably enable sharpening, or conversely if your camera has a noisy sensor you may want to apply a certain level of noise reduction by default. Maybe you'd like to set your name in the IPTC "Author" field and have RawTherapee copy your metadata changes to the saved files. You will generally want to leave the white balance set to "Camera" since your photos will be taken under various lighting. When you are done tweaking, click the Save Current Profile icon in the Processing Profiles panel. Enter any name; you don't need to specify the extension - RawTherapee will add it for you. To have it appear in the drop-down list you need to save it to the "profiles" sub-folder in the "config" folder - refer to the File Paths page to find out where this folder is on your system. Restart RawTherapee, and now your new processing profile will appear in the drop-down list under "My profiles". Sometimes, you will want to save only a subset of the parameters available, e.g. to avoid storing geometric parameters like rotate, crop and resize. In this case, hold the Control key while clicking on the Save button. When you select the output file name and click Save, a window will let you choose which parameters to select. You can then share these profiles with your friends or in our forum. Remember that in order for a profile to be universally applicable to all photos of the same scene and situation (baby portrait photos in this example), you need to think of all the variations in all of the baby portrait photos you might want to apply it to. Remember that exposure will vary between shots, even if you shot the baby in a studio, as the little one is likely to be crawling around, and even more so if you upload your profile on the internet for other baby photographers with different cameras and different lighting gear to use, so instead of setting a specific exposure, such as +0.60, you should rather turn on Auto Levels. This applies to all other settings - remember to set just the bare minimum number of options to achieve the effect you want. Leave the rest untouched, as it is very likely that if you had set those other options, they will not apply well to other photos. If your processing profile is meant to make baby face photos look soft and cuddly by a clever mixture of highlight recovery, auto exposure, Lab and RGB tone curves, then don't enable noise reduction (as photos might be shot at different ISO values), don't set custom white balance (as light may have changed between shots), don’t rotate the photo, and so forth. All these superfluous parameters are likely to change between photos and not influence your soft baby look in any way, so turning them on will just litter your profile. Double-check these things before sharing your profiles. To use your own processing profile as the default for raw or non-raw photos, set it under "Preferences > Image Processing > Default Processing Profile". If you want to use a dynamic profile, then set "Default processing profile for (non/)raw" to "(Dynamic)". This page was last edited on 19 December 2018, at 13:29.